Bali, Indonesia. An incredible island filled with beautiful beaches, mountains, greenery, in addition to cheerful and welcoming people who are always smiling and happy to see you. Bali was a place for us to spend 4 weeks and soak it all in slowly. We had been averaging three nights per location and we were becoming weary with all the constant movement on trains, planes and tuc-tucs. 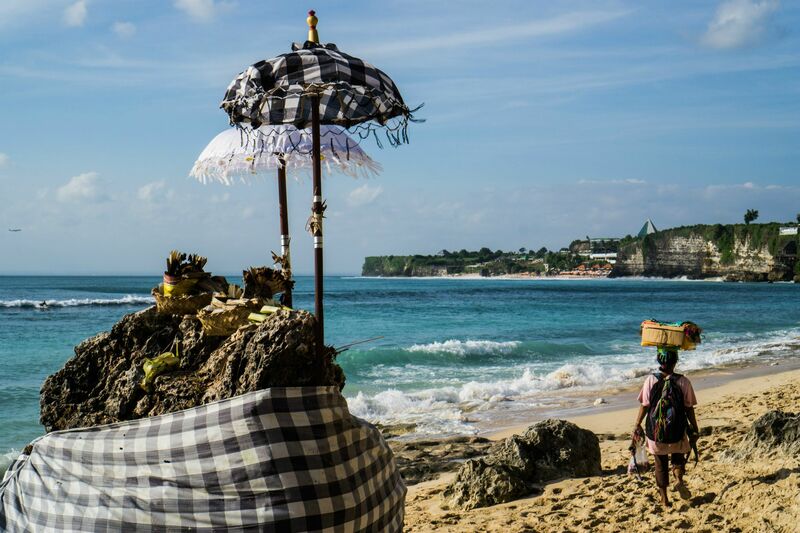 The island of Bali was a great place to take a break. It is small but has so much to offer. One week of our time was spent exploring the beaches. The other three weeks we based ourselves in the culture hub of Ubud more inland near the rice paddies and mountains. A common sight on Bingin Beach. After arriving in the Denpasar Airport, we immediately were immersed in the happy and beautiful culture. The Baliense incorporate art into their life more than any other culture we have seen. Their buildings, temples, doorways, batik clothing and statues are intricately detailed making every corner you turn feel like you are walking through a living art museum. Not to mention the immense beauty of the landscape. Seminyak was the first place we based ourselves for 4 nights. We used SPG rewards points to stay at the newly opened Four Points Seminyak which was very nice. Seminyak had some great Aussie influenced “Brekkies” (breakfast) and we frequented Sisterfields and Watercress restaurants for some delicious smoothies, fresh juice, delicious coffee and great avocado toast. We also dined at Bambu restaurant for elevated Indonesian food. The tables in the restaurant were elevated above small pools of water making you feel like you are dining on top of the water. 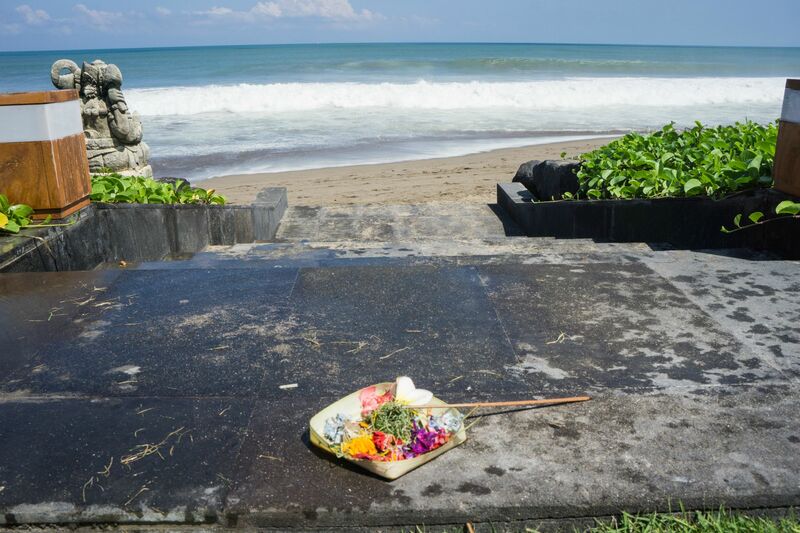 Canang Mari offering on the beaches of Seminyak. Next we moved further south to Ungasan. This was the most beautiful part of the island for us. Hidden beaches, surfers, local people and less of a “spring break” feel like Kuta and Seminyak. We rented mopeds for our “off the grid” Airbnb we stayed in and explored some of the most beautiful areas. Melasti cliffs and Bingin beach were the highlights. We scootered around Melasti (watch the video for the amazing scenery!) and we had to take hundreds of stone stairs down to the little surfer paradise of Bingin Beach. Green bowl beach and Karma beach were awesome to see as well, with many stairs to get down the cliffs to the beach. There aren’t many restaurants in the area, but Single Finn restaurant and bar close to Uluwatu Temple by far had the best sunset views but you have to get there early before 5 to get a seat for the incredible sunset show. Enjoying the sunset views from Single Finn. After checking out the beaches, we headed inward to Ubud where we stayed for 3 weeks in the Royal Palm Villas through Airbnb. Ubud has so many great cafes and restaurants which are mixed in between the city and the rice paddies. Nasi Campur, Nasi Goreng, Gado Gado and other Indonesian specialties were great from the warungs (local restaurants) and were washed down with fresh juices or local Bintang beer. 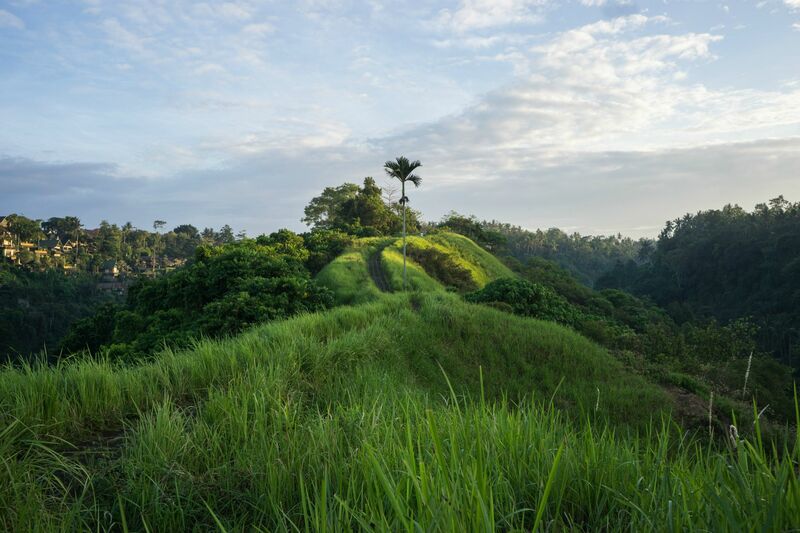 The Campuhan Ridge in Ubud was one of our favorite sites as it was within walking distance from our place. Early mornings on the ridge were absolutely beautful with its contrasting colors and serenity. The Campuhan Ridge walk became a morning ritual for us. Josh hiked the tallest mountain- Mount Agung – before sunrise. He got up at midnight to leave to hike the mountain to make it up before sunrise. Pretty amazing views from the summit (see our photos). We both later hiked Mount Batur and got to leave “later” for this one, our pickup time was 2am to see the sunrise. Watching the Seeing the mountains, lakes and villages of Bali below Mount Batur in the early morning with a spectacular sunrise has been the highlight of our trip thus far. 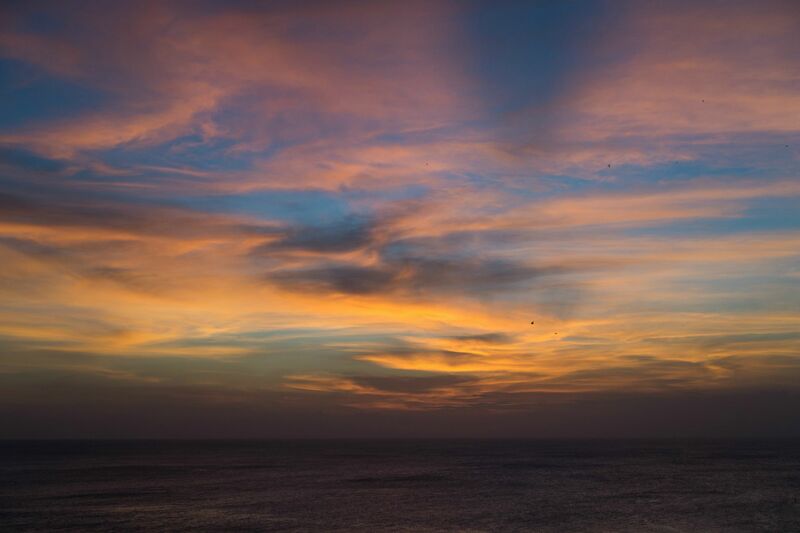 The beginning of our Bali video features the sunrise we saw compressed into a few seconds. Check out the article featuring our experience trekking the volcanoes of Bali. 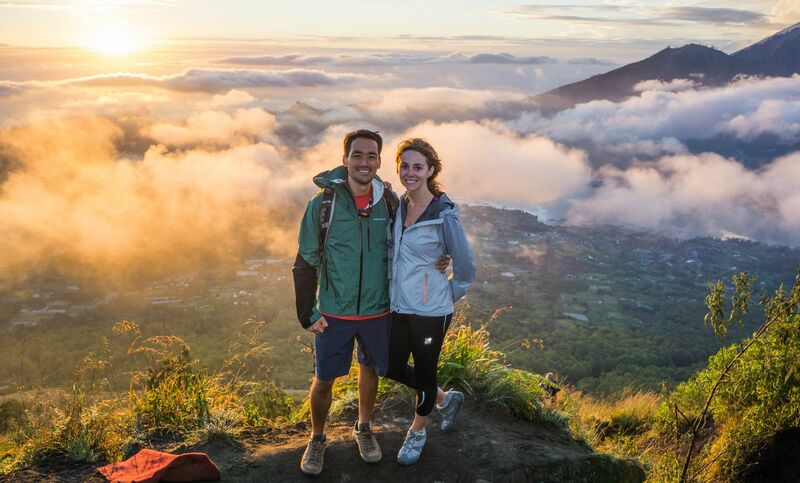 Trekking Mt Batur for sunrise is one of our favorite experiences on the entire trip. Besides hiking, Natalie improved her yoga practice daily at the Yoga Barn and Josh did more biking and hiking. After meeting some locals from an art class, we were able to join Kadek to his local village near Gianyar for the Indonesian Independence Day festivities. Watching the kids compete in the slippery eel race, rice cracker contest and the nail in the bottle game was pretty hilarious. Josh even joined in on the fun and came in dead last in the potato sack race (watch the video for his embarrassing loss to the locals)! Overall, Bali was one of our favorite places on our trip and we would highly recommend seeing this beautiful country if you are considering it. We were sad to leave and hope to return again someday.